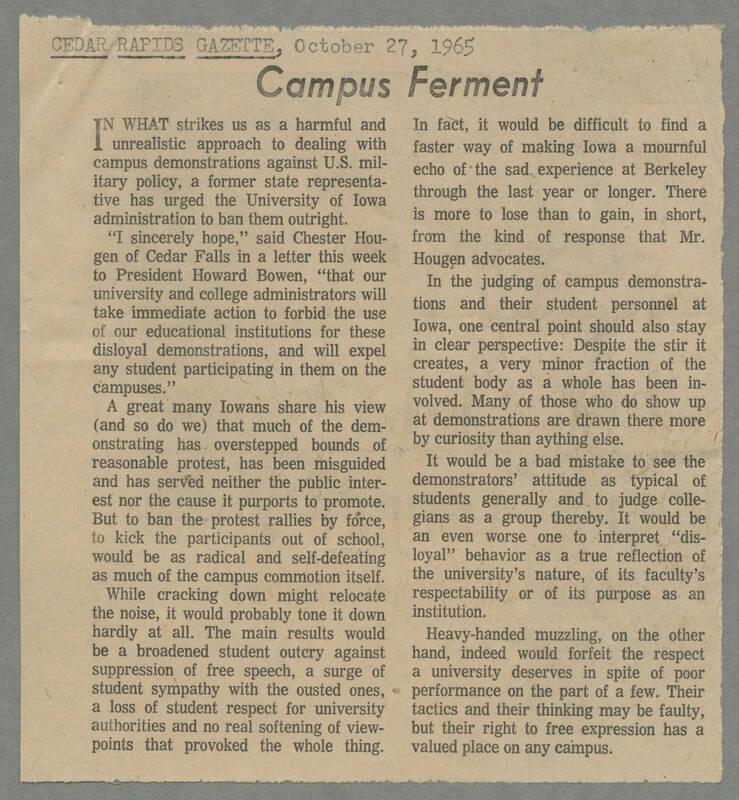 DIY History | Transcribe | Social Justice | Student demonstrations correspondence, 1965 | 1965-10-27 Cedar Rapids Gazette Article: ""Campus Ferment""
1965-10-27 Cedar Rapids Gazette Article: ""Campus Ferment""
CEDAR RAPIDS GAZETTE, October 27, 1065 Campus Ferment IN WHAT strikes us as a harmful and unrealistic approach to dealing with campus demonstrations against U.S. military policy, a former state representative has urged the University of Iowa administration to ban them outright. "I sincerely hope," said Chester Hougen of Cedar Falls in a letter this week to President Howard Bowen, "that our university and college administrators will take immediate action to forbid the use of our educational institutions for these disloyal demonstrations, and will expel any student participating in them on the campuses." A great many Iowans share his view (and so do we) that much of the demonstrating had overstepped bounds of reasonable protest has been misguided and has served neither the public interest nor the cause it purports to promote. But to ban the protest rallies by force, to kick the participants out of school, would be as radical and self-defeating as much of the campus commotion itself. While cracking down might relocate the noise, it would probably tone it down hardly at all. The main results would be a broadened student outcry against suppression of free speech, a surge of student sympathy with the ousted ones, a loss of student respect for university authorities and no real softening of view points that provoke the whole thing. In fact, it would be difficult to find a faster way of making Iowa a mournful echo of the sad experience at Berkeley through the last year or longer. There is more to lose than to gain, in short, from the kind of response that Mr Hougen advocates. In the judging of campus demonstrations and their student personnel at Iowa, one central point should also stay in clear perspective: Despite the stir it creates, a very minor fraction of the student body as a whole has been involved. many of those who do show up at demonstrations are drawn there more by curiosity than anything else. It would be a bad mistake to see the demonstrators' attitude as typical of students generally and to judge collegians as a group thereby. It would be an even worse one to interpret "disloyal" behavior as true reflection of the university's nature, of its faculty's respectability or of its purpose as an institution. Heavy-handed muzzling on the other hand, indeed would forfeit the respect a university deserves in spite of poor performance on the part of a few. Their tactics and their thinking may be faulty, but their right to free expression has a valued place on campus.